I have got numerous queries from investors regarding the prospects of Suzlon in the short term and long term. This article brings out the trends, analysis and foresight of Suzlon .Investors should use this article for information basis and not for trading strategies. 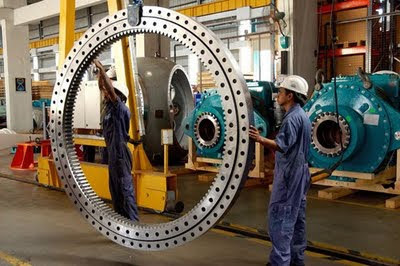 Suzlon Energy Ltd., India’s biggest maker of wind-turbine generators, said it completed a global blade retrofit program after spending about $100 million. Suzlon Energy Limited (SEL), the world's third leading and India's largest wind turbine manufacturer, announced the completion of its worldwide program to strengthen and reinforce all Suzlon blades of the V2 type on its S88 - 2.1 MW turbine fleet. Instances of blade cracks were discovered in late 2007 during the operation of some of Suzlon's S88 wind turbines in the United States. Suzlon acted immediately and rectified the work. The company initially provided Rs 19 crore towards damages. But the complaints kept on increasing. As of June 22, 2009, 179 damaged blades were reported. 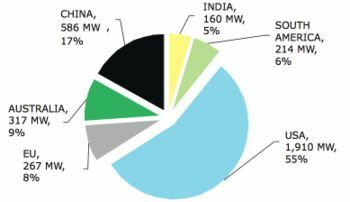 For the quarter ended March 2009, the company provided Rs 104 crore for the blade retrofit and replacement availability compensation, taking the total provisions towards this to Rs 553 crore till date.This will give suzlon some space to prove its capability of service as well as its lost good will be recovered.The below image depicits the Suzlon business area. In parallel with strengthening the S88-V2 blades, Suzlon also introduced the next-generation S88-V3, which is consistently delivering and exceeding performance standards at windfarms around the world. One of Suzlon's S88 turbines produces enough energy to power approximately 500 average American homes. This new venture of projects will help suzlon to develop the products that will meet the requirement of new US wind and Energy and Water Development and Related Agencies Appropriations Act..As of March 2009, order backlog declined 57 per cent y-o-y to Rs 7,900 crore which translated to a 58 per cent decline to 1,464 MW (1389 MW exports and 75MW domestic). It has also completed and commissioned a 19.5 MW wind farm project for Gujarat Mineral Development Corporation in Rajkot district of Gujarat.In the month of April the North America arm of Suzlon Energy Limited, has signed a repeat order with Duke Energy, of Charlotte, North Carolina, to provide 20 units of the S88-2.1 megawatt wind turbine.It have even signed deals with that will comprise of 63 units of Suzlon's S88-2.1 MW with austarlia.In other words the company have made multifold expansion in addressable market and new order wins - US, Brazil, China, Australia, Spain & EU. Three promoters of wind power major Suzlon Energy have sold approximately 70 million equity shares, representing 4.5% of the paid-up capital of the company. The funds generated through the stake sale will be ploughed back into the company either in form of debt or equity. The promoter holding after the sell-off will be reduced to 53.08 % of the paid-up capital. During the past three quarters, the promoters of the Pune-based company have sold part of their shareholding in the company three times to reduce the overall debt that currently stands at Rs 11,800 crore. The company has been extensively engaged in selling its ventures and raising funds for its expansion. It reveals that the company have less fund in its hand to go for any expansion based upon its internal accruals. The company is also flooded with huge debt. Quarter profit on June 2009 drops by 84.56% as compared to quarter March 2009.We don’t find any consistency in quarter profit although their was no loss but too much wide variations. Other income of quarter June 2009 drops by 82.92% as compared to quarter March 2009.For the June 2009 we find operating income went into minus.Operating income deals with the profit that is generated via operation of Suzlon. Interest cost increases by 130% in half yearly March 2009 as compared to half year September 2008.This eats away the profit pie of the company giving less profit and more loss in the hands of the share holders. Secured loans grow by 495% in March 2009 yearly report as compared to March 2008. Unsecured loans go up by 37.76% for the same period. Companies fixed deposits drops and current liabilities jumps by 69.61% for March 2009 yearly report. Other income for the 12 months period from March 2008 to March 2009 drops by 4481%.Yes I am correct and you read also correct. The drop we find is enough to freeze bones. Other income for the period of March 2007 to March 2008 we find a drop of 63.20%.So we get a consitency in fall. And finally asministrative expenses goes up by 425%,selling expenses goes up by 37.87% for the March 2008-2009.More starnge is that manufacturing is happening very less.We find that manufacturing expenses goes down by 24.67% for the period 2009-09 compared to 2007-08.Expense increase makes outflow of cash more as compared to inflow.Its also reveals that management inefficient use of resources and assets. 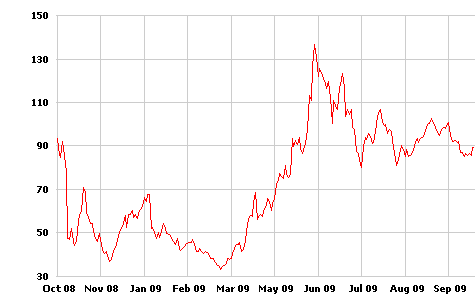 According to William %R we find that Suzlon is in climbing over brought levels . We find distribution of shares and no accumulation. In the month of September and August we find accumulation but from the month of October we get distribution trigger falling into minus zone. This indicates that investors are skeptical regarding its 2nd quarter results and moves away from buying. Stochastic RSI reflects that its above over brought level and correction is in the wings. We will not get much movement in the scripts. Even climbing the level of Rs.100 depends on some major turn around within the company and 2nd quarter results, other wise the look out is very poor.The chart below indicates the William %R,Accumulation and Distribution,Macd and Stochastic RSI. The company is over burden with huge expenses and debts. The interest cost eats up majority of its profits, leaving less for share holders investment appreciation. Its expansion plans are quite highly in dark as when ever the company will plan for expansion it needs to borrow funds. It cannot fund any expansion without raising funds. So when ever the company plans for expansion its profits will decline. The company can only improve its profitability by reducing debt. No other support is required apart from other source to increase profit. Obviously it also needs to put a tab on its rising expenses which have climbed to avearge 350%.The company have projects in hand and is also tapping new projects but the operational profit of the company remains under pressure. Its overseas acquisition have created the burden of debt and now its also engages himself in selling those ventures as well as reducing the promoters share holding. This might lead the company in the long term to face hard times in management holding. It have faced quality issues for which the company spends four times more than its initial estimate of $25 million made in March 2008.So this will also add on the increased burden on the profitability of the company.The belwo chart depicits the price of Suzlon for the past 1 year. In one place the company is growing in positive line is that its still gets small and big projects in over seas countries. But what ever order it has will take time to complete and generate profit from those projects. So it’s a very long term call. Moreover big projects have taken a hit due to recession and delay of projects. The US solar and wind projects may not come in the hands of suzlon as US climbing unemployment raises a question that whether to go for Indian market or US own domestic market for turbines. Since the latter will create more jobs for US. Moreover the falling dollar will effect its overseas payments. As a whole rising debts and expenses followed with less internal funds for expansion will results less return to the share holders. Investors will not get much gain by doing investment in this script and should exit from this script. Long term investment can only be done only based on two factors. 1.The scripts is available around 30%-40% below from present price and 2.Once its loan book get reduced since that will result to less interest cost and higher profit. So its long term recommendation depends on these factors. We need to keep an eye on its debts. Once they start reducing, investment can be done where investors will gain on their investments. I agree with Mr. Indraneel, as both the fundamental and technical view gives way for downward trend. But i think Suzlon linked to Alternative Source of energy, has nothing to loose in long term and will perform fairly even in the worst markets. And when coming to huge debt, initially company need Capex, for which if public issue is not sufficient then promoters are left out with no choice. I would like to have the current view on Suzlon. Mr Indraneel was accurate that investors should disinvest last year. Is it a good time to invest now. Mr Indraneel was accurate in his review of Suzlon last year. What is the current view. YES YOU CAN GO FOR INVESTMENTS AT THIS POINT OF TIME BUT I SEE MORE DOWNSIDE TO COME IN THE NEAR TIME.ONE CAN FOR BUY BUT WITH REGULAR INTERVAL OF FALL. You might qualify for a new government solar energy rebate program.